Coming out of college, Joel Embiid was renowned by scouts as a near-complete prospect. With graceful footwork and a vast array of dizzying post moves, the former third overall pick earned comparisons to the likes of Hakeem Olajuwon and Shaquille O’Neal. Outside of Embiid’s salivating strengths, though, scouts pointed to one glaring (non-injury-related) weakness: passing. In the collegiate ranks, swarming the big man with double teams from the short corner was a reliable avenue to force Embiid into a turnover. Relatively new to the sport, Embiid was over-stimulated by the constant movement of cutters and defenders (Embiid was one of just five players to have a turnover percentage of 21.5 or higher while playing 23 minutes per game). Now three years and countless double teams deep into his career, the former Kansas standout has finally started to recognize those double teams looming, and react accordingly with crisp passes to the inevitably open man. Embiid has torn a page from the book of Nikola Jokic by devising calm decisions from the low post — this year is his first season without a negative assist-to-turnover ratio (current dead-even at 1:1 with 3.5 each per game). In each of his three seasons, Embiid has added a physical element — whether it be the James Harden swim move, the potent face-up maneuvers, or the refined mid-range jumper — to his game, catalyzing this year’s MVP-like explosion: 26.9 points, 13.5 rebounds, and 3.5 assists. No improvement, though, is more helpful than his decision-making in the post. Despite dishing out more assists each season, Embiid has become more cautious, coinciding with a decrease in turnovers. In his rookie season, Embiid was first in turnover rate for players who posted up four or more times per game (12.2%). In his second season, he jumped to fifth (9.3%), and now, he stands at tenth (7.2%). With a passer of Ben Simmons’ caliber already on the roster, few fans notice Embiid’s own distributing prowess. Last season, in the 63 games in which he appeared, the Cameroonian big man had five or more assists on 12 separate occasions. This season, he has already tallied 11 such games at the 42-game mark (he also recorded his first 10+ assist game). Last year, when a guard executed an “entry pass” (entering the ball into a post-up) and cut, the defender tracking the post-feeder abandoned his original duty to swarm Embiid’s post-up. Embiid would respond by trying to squeeze the ball to the cutter — a dangerous pass. In the first clip of the above sequence, Embiid demonstrated just how much he has improved his decision-making this year. Last year, he would have tried to squeeze that pass to Korkmaz, the cutter, but instead, he waited until Korkmaz looped back around for a more efficient DHO. In the third clip, Embiid steps-through both defenders to make the passing distance shorter. Jimmy Butler enters the ball and McConnell (who starts at the top of the arc) cuts to the opposite corner. The weak-side defender, Norman Powell (originally guarding McConnell), doubles Embiid once the latter turns his back. Instead of keeping his back turned, Embiid steps-through Powell and whips the ball to McConnell. The advanced and general statistics and film are undoubtedly in favor of Embiid improving his low-post vision. However, he’s still far from a finished product. Looking at the glass half-empty, the big man makes too quick of decisions by shooting the ball as soon as the double team appears. Other times, he spins away from both defenders, losing sight of the floor. As previously mentioned, quick decisions can lead to more ball movement. However, when Embiid makes quick decisions before surveying the court, it leads to one of two things: a shot early in the shot clock, or a contested shot. Both options are bad. At times, like in the play above, Embiid is forcing things in lieu of letting the game come to him. There are many scenarios — like when he committed seven turnovers last game against Washington — where Embiid seems rushed. 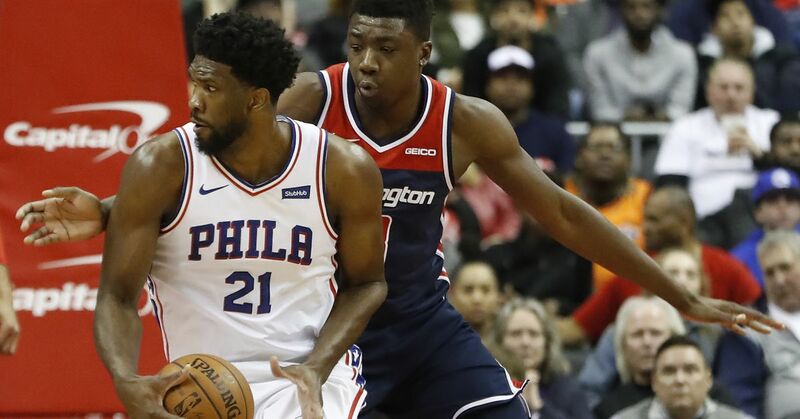 Deciding when to speed up and when to slow down is a tightrope to walk for developing players, as Brett Brown noted before the win over the Knicks a few weeks ago (courtesy of NBC Sports Philadelphia). Another time when Embiid carelessly zooms past the speed limit is when he is fading away from the basket. One of my past basketball trainers had this advice: never turn your back from a double team. Turning away, so it went, was akin to waving the white flag to an enemy. In too many instances, Embiid turns and, thus, loses the periphery of the court. When you’re as dominant in other areas as Embiid, either mistake is mended with time and practice. If Embiid cuts down on the spins and, instead, opts for more face-ups, he will increase his number of assists while decreasing the (relatively) high number of turnovers. Of course, it’s par for the course that teams continue double-teaming Embiid. With Simmons and McConnell so often paired with him, teams will simply help off either aforementioned player to double Embiid in any way possible — whether it’s from the dunker’s spot, the opposite corner, or via entry passes. That is simply a fact, and unless Brett Brown finds a simple solution (hint: there’s not one), Embiid needs to continue improving his post-passing. That being said, early signs are promising and if he continues trending upward, expect the Sixers’ offense to skyrocket to new levels.